Thomas Goetz is co-founder of IODINE, a new company that uses data information design to inform patient decisions. He’s been a TEDMED speaker, executive editor of Wired, and wrote “The Decision Tree,” about using technology to help make health decisions. You’re now Entrepreneur-in-Residence for the Robert Wood Johnson Foundation, working on two projects to improve the patient experience. Can you first talk about Visualizing Health? We’ve created a library of validated health visualizations. When people talk about communicating health information to individuals, there’s a dearth of validated examples of what the information should look like. For example, if you’re trying to communicate heart risk information – if you quit smoking, your risk will of cancer will go down from 50% to 30% — what does that look like in actual practice? There are the Edward Tufte’s of the world who have an expert [design] sense. But we wanted to actually validate, though statistical surveys and other testing instruments, what works best for different groups. We tested pie, bar and spread charts and different visualizations on various audiences and now have a library. We’ll be putting it online, hopefully by early February, for people to use as a reference point under a creative commons license. Our hope is that these will become templates that people can inspire and adopt in their own patient communications efforts, whether they are commercial or non-profit. It seems that over the course of human history we’ve been all too willing to give over responsibility for our health, letting the apothecary leach blood or trusting that the medicine man’s dance will cure us. What accounts for this new era of patient engagement? In many ways it’s a continuum from the 1950s or ‘60s. We’re now in a place where we can implement things more deliberately. One of my favorite surveys to reference is a 1961 survey that asked oncologists how many of them would tell their patients that they had cancer. And 90 percent of said they would not disclose the diagnosis; that their patients were probably not ready to know. Of course, that seems completely unethical now. The gradual change in terms of doctors learning to include their patients in diagnosis and care is forced not just by a sense of ethical duty, but also by system structures such as the burden of cost of chronic disease care. A patient with chronic [illness] may be obligated to do a lot of care on his or her behalf when they can’t have help 24/7. All of these things are coming to a head, and we’re realizing it’s not just a matter of good practice but one of simply executing what we need to do. The patient has to be part of the system. Another of your projects with RWJF is Flip the Clinic, which talks about how to rethink a typically brief doctor’s visit to make it more productive and meaningful. We’ve been trying to come up with some tools to put in the ecosystem that people can adopt or give feedback on, including ones we’ve gestated internally but also deconstructing things out there that have worked. We haven’t invented the idea of improving the doctor-patient encounter, but we’ve been amazed to see Flip the Clinic resonate already as a sort of GitHub – the open software collaborating site — around the practice of clinical medicine. The idea is to help people not reinvent the wheel and [adapt what’s available] to their own needs. When it debuts, fliptheclinic.org will have two main areas: A hub for content – actual tools and strategies people can bring into their own institutions – and secondly will have a community component where people can exchange what they’ve learned, offer new ideas, connecting, say, people from Seattle to New Jersey and helping them understand what has worked in one place that may help solve a similar quandary in a different city. What qualifies as real change? It’s a balancing act – we want to have real innovation but we need to offer tools that don’t just appeal to the converted; they need to work far and wide. Late last month, I had a morning where first I talked to a nurse practitioner at a pediatric clinic in Camden, New Jersey, which is in an underserved community. They’ve having their clinic budget hatcheted every quarter. Physicians are frustrated. This is a facility in true need of new approaches and something that re-orients them toward a positive engagement with their population. I went from that call to one with the Mayo Clinic; they were interested in how they might be able to participate. These are institutions on the opposite end of the spectrum, and one of our core objectives is for Flip the Clinic to work in both places. In initial discussions, it turned out that both providers and patients wanted more control over clinic visits. What else do they want? 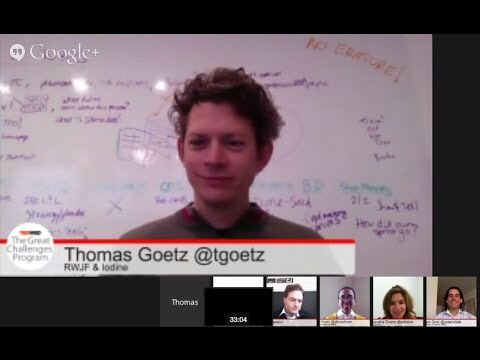 Goetz moderated a Great Challenges Google+ Hangout last week about rethinking the clinical visit to maximize value for both providers and patients. Watch the recap, below. Regarding your new venture, Iodine, which uses data design to help inform patient decisions: Is good design late to the game with healthcare? Or it is on the same trajectory as other industries? I think design is an underexploited tool in healthcare, though it’s ahead of the curve in some ways. Health care and medicine are already based upon a data paradigm; there’s a lot of information flowing through the system. But best practices in design thinking are not well applied, and they’re not oriented towards the patient. Our goal is to leverage data, to translate it and visualize it, so that ordinary people can act on it and make better decisions about their medications. That’s not an easy problem. While you were at Wired you ran a great piece showing how design could help patients understand their test results. How come doctors haven’t already demanded better design for their own information? It must be hard looking at that gobbledygook all day. Unfortunately, this brings us to the horrible world of EHRs. The prevailing industry products are really crappy in this regard; they come from an enterprise software perspective that’s 10 or 20 years old. A physician is almost always not making decisions on technology procurement. Unfortunately, sometime it doesn’t matter what your frontline needs are compared to the cost determinations of your IT department. The cool thing is that there is another set of savvy tools going straight to the physician that are lightweight and easy to adopt. There are some companies like Practice Fusion and Pingmd doing innovative things with communications or messaging component. And other companies are working on visualizing lab data, like WellnessFX. That’s a much more interesting strategy and more fun to watch. Sometimes developers use the iPad strategy — taking what physicians are already using and making that your platform, rather than the institutional computer system. One can’t imagine the current generation of medical students going into the clinic and being satisfied with old-school data design. That’s precisely where one of these pressures is going to come. The current generation of physicians is being dragged along into the EHR world. The next generation is going to lead the way, I think. They’re going to demand better tools, both for themselves and for their patients. That’s the world I want to live in; that’s the world I want to in some way help create.